Every now and again you find hidden gems whilst trawling the darker reaches of the internet. 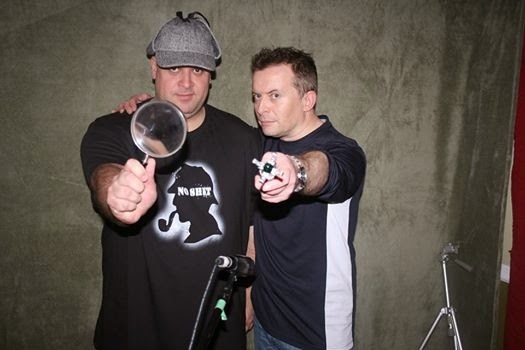 This week it was Doctor Who: Dark Journey, a Canadian fan made audio adventure produced by AM Audio Media, featuring Doctor Who (of course) and Sherlock Holmes. Doctor Who: Dark Journey is an original full cast audio adventure which takes The Doctor on a darker journey than ever. Emotionally shattered after a tragedy The Doctor arrives in London and becomes companion to Sherlock Holmes in an effort to stop Jack the Ripper’s murderous trail of terror. But is there an even greater evil at work in Victorian England? Dark Journey is a multi-episode series written, performed and produced in Toronto with a Canadian and international cast and crew featuring the music of Doctor Who fan favourite Traffic Experiment. With Doctor Who - Dark Journey, AM Audio Media has twisted the ‘Whoniverse’ of Doctor Who in a subtle way, making it a little darker, but without losing the essence of what makes the show as brilliant as it is. Dark Journey tells the story of a new Doctor, on his last life, haunted after a mysterious tragedy but still very much ‘The Doctor’ that fans around the world have enjoyed through his adventures on television, books and audio. AM Audio Media has emphasized intriguing elements of the show’s mythology and run with them. It’s a version that you would probably never see on TV but can exist, quite happily, as a standalone, alternate version. Dark Journey has found an audience who like their ‘Who’ a little darker. With this extremely positive fan response AM Audio Media is currently in production of further adventures of The Dark Journey Doctor. Doctor Who Copyright © BBC. No infringement of that or any other copyright is intended. Doctor Who: Dark Journey is a non-profit, unofficial, fan production. Don't be put off by the term 'fan made'. These adventures have a high production value about them (one that matches that of Big Finish), the acting is very good and the storyline flows along very nicely. I'm not normally a lover of crossover stories but this one had me from the very start. So much so that I can't wait to hear the next series (which is currently in post-production). Doctor Who: Dark Journey is a five part adventure (running a shade under an hour in total) which you can listen to for free here.